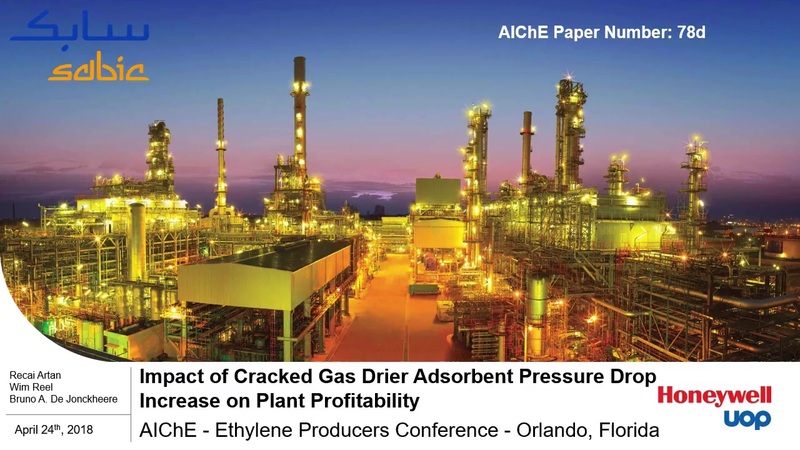 The impact of pressure losses on the profitability of a steam cracker are important and can be quantified. This is illustrated with the changes SABIC Geleen has implemented on Olefins IV during its most recent turn around. One of the adjustments has been to add a third dryer to the two-bed cracked gas dryer dehydration system. In all steam cracker configurations, the cracked gas drying plays a critical role as all of the cracked gas requires dehydration prior to cryogenic cooling and separation through distillation. The dehydration unit is located between the steam cracking furnace and the cold / cryogenic fractionation. As cracking happens at near atmospheric pressure and separation is operated at elevated pressure, the furnace effluent stream must be compressed. Downstream of the compression train, the cracked gas is dehydrated in order to avoid hydrate formation in the downstream cold fractionation train. Pressure drop over these, often large, dehydrators must be kept as low as possible, because pressure drop comes at a cost. This paper summarizes how different causes contribute to pressure drop buildup and how to estimate the cost associated with it. It also provides insights on how to detect these causes early on and proposes actions to minimize the pressure drop build up. This presentation will outline some basics and innovations that may help students better meet future industrial chemical engineering design challenges.